There is something romantic about outdoor wedding ceremonies. Whether you have the wedding in a field, beach, or winery — the natural elements always lend a beautiful backdrop. It allows the opportunity of an adventurous planning and a personal touch. 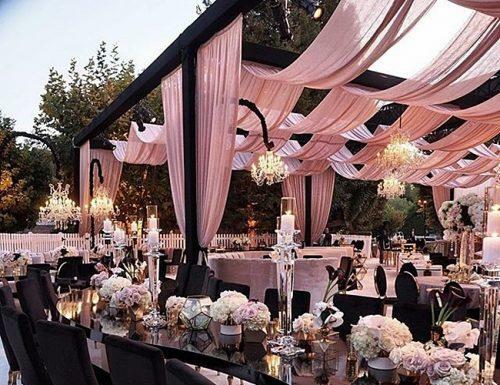 We have compiled great ideas on how to plan an outdoor wedding that matches your budget. 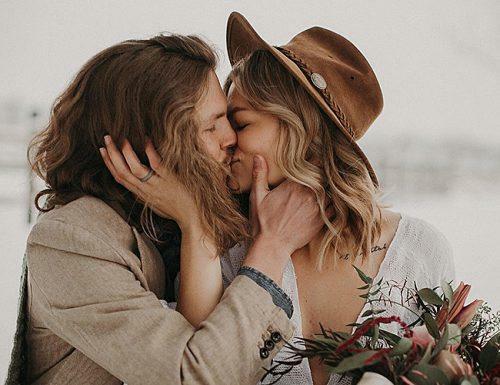 There are also useful tips on how to create an outdoor wedding checklist that will guide you in pulling off one of the most stunning outdoor ceremonies ever. Weddings done outdoors bring out the creativity in couples because there is enough space to explore their imaginations. As lovely as this is, the wedding is not legal unless the venue is a licensed one. However, if the venue is not licensed but the couple loves the location, they will need to do a legal wedding separately. In fact, wedding outdoor is classy and beautiful, but there are some ups and downs to consider. No doubt, outdoor beauty has a unique allure that beats any other wedding location. The amazing sunset that graces outside night weddings, the smell of the falls, the spring blooms. Wedding outdoor will suit any of your favorite time of the year. And nature is that accommodating! Rent a field for a wedding and it can never be overcrowded, no matter the number of guests. Guests should never be confined to stuffy spaces. Outdoor wedding locations give flexibility to sitting arrangements and movements. So, if you’re thinking of a small backyard wedding ceremony idea or a big wedding, the outdoor allows space for fresh air and easy breath. Ceremonies are for a day, but the memories last a lifetime. So, why not capture beautiful memories that will stay with you for always? As a rule, you decide it when planning an outdoor wedding, because the venue plays a huge role. Moreover, open-air venues provide magnificent backdrops of nature with the earth and sky elements in their natural habitat. These give the pictures a timeless glow. I love outdoor weddings, but allergies and phobia to crawling and flying things will never let me enjoy it. In an indoor wedding, insects can be controlled, but not in an outdoor wedding. Bees, spiders, bugs, mosquitoes, and flies can cause allergic reactions especially at wineries and weddings in a field. I will encourage bug zappers, sprays, citronella candles, and the likes should be used to control these pests. For guests who are allergic to pests, an indoor space will come as a relief. Outdoor space is great for a large guest list, but the surroundings can drain the voices of people. Those sitting at the back may not hear the couple take their vows, it is wise to invest in amplifiers and microphones. In general, two greatest enemies of outdoor weddings are temperature and rainfall. Make sure to have outdoor wedding rain plan ideas, so that the weather will not dampen your special day. Also, it is important to state on your invite card that your wedding is holding outdoor so that guests will be well dressed for the weather. If your wedding is not holding on a private beach, a lot goes in on how to plan an outdoor wedding. 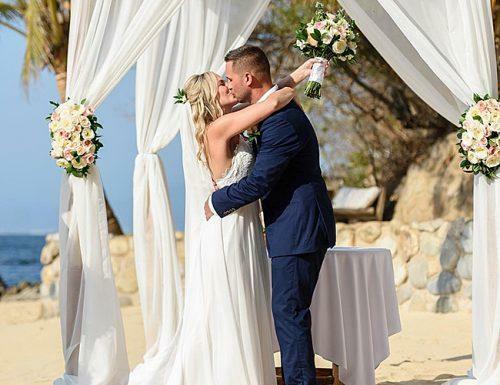 Celebrating weddings on the sands are colorful and brings you closer to nature. A beach wedding comes with challenges, but with a standard checklist, you’re covered. There will be outdoor wedding music. If the number of attending guests is high. If you need to reserve some parts of the sand for a period of time. Here you do ensure that other activities on the beach do not clash with the date of your wedding event. 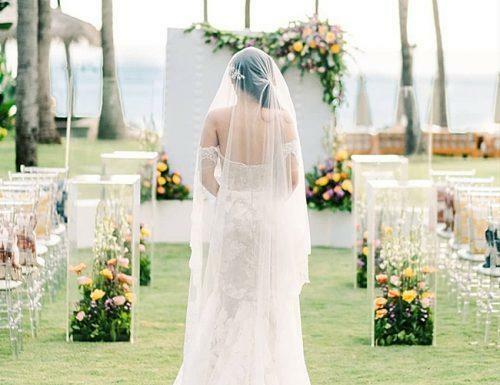 Since it is not a private beach, there is the possibility of things like a public event or construction happening on the same day of your wedding. Also, this will cause photo bombing and distractions that could ruin your big day. Therefore, reserve specific slots, if possible for the wedding. Thinking of incorporating outside tent wedding ideas and sizes. Planning on having amplified sounds. Allowing guests to bring their pets along to the wedding. When the tide will get high. Weather forecast, so that the couple comes up with outdoor wedding rain plan ideas. The strength of the wind which will determine the strength of the décor. How noisy the wedding location will be. Accessibility to the city, guests and wedding vendors. Beach Curfew, in the case of outside night weddings. Generally speaking, most backyards serve as gardens and are very cozy. And a perfect setting for planning a garden wedding. This is one of the cheapest wedding types. Also, there are styles on how to decorate backyard for weddings to give it a magnificent look and an effortless appeal. I love backyard wedding because it is my personal space and it feels familiar. I have unrestricted options to customize it to my taste and style. Here are some small backyard wedding ceremony ideas on how to plan a wedding. Provide cozy blankets to keep guests warm at night. Choose to say your vows in lush surroundings or under the shade of a big tree. Create an outdoor entry space, using colorful steamers. Point guests in the right direction using DIY signage. Don’t let the weather spoil the day. Prepare a garden wedding shelter, also have umbrellas on standby. Make available loads of chilled beer with a barbeque buffet. Decorate a golf cart with flowers and tulle for your getaway. 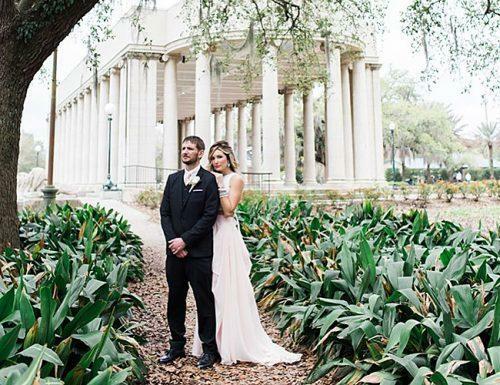 If you are a lover of the outdoors, then we should be talking about how to have a park wedding. Nothing beats a natural setting and the glorious sunshine. In addition, it is very affordable and most times, the venue comes free of charge. While thinking of park wedding reception ideas, remember that it is an open space. Of course, there will be challenges, especially the weather and unwanted pests. A wedding cake cover will keep the cake intact and protect it from pests. The local park in your city or a park of your choice avails you to be at peace with nature while having a romantic wedding. Below are park wedding ideas to help you create your dream wedding. Confirm opening and closing hours of the park. The days that are free for weddings and if there are restrictions. Decide what part of the park to get married in. The hillside, tree shades or coves are perfect choices. Find out if there are nearby restrooms. For how to hide the bride at an outdoor wedding. This is the time to map out the entry point of the bride. A point where the carriage or tent bearing the bride will come through to the aisle. Know the rules of the park. Have a backup plan, the weather is always unpredictable. 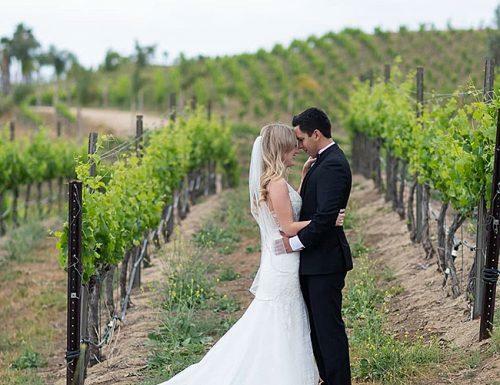 In particular, a winery wedding can be indoors, outdoors or a combination of both. This brings out the inspiration on how to make an indoor wedding look outdoor. A winery wedding is unique, romantic and unforgettable for you and all the guests. Make your wedding décor, florals, furniture etc. blend with nature. Go with rustic colors to match the countryside ambiance. Fill the place with assorted drinks. We know it’s a winery but add some cocktail. Book a winery at the time of the year when the leaves and foliage appeal to you most. Hire local caterers. Eat local food. Arrange transportation and book accommodation for guests. This is because wineries are often isolated from cities. Make the journey easier. Give a souvenir that goes with the winery theme. i.e. bottles of wine, customized cork stoppers etc. Do you love the outdoors? Are you planning an outdoor wedding? Well, here are strategies to help you pull off a pleasant outdoor ceremony. No matter where you host your wedding, it should be accessible. The handicapped, elderly and out of town guests should be able to reach the venue easily. Thus, there should be signs to show guests directions to facilities.i.e restrooms, reception etc. When planning an outdoor wedding, consider the beautiful natural landscape and take advantage of it by blending your décor into it. Choose the décor materials according to the wedding theme, so that there won’t be a clash of colors. String lights and bulbs for weddings. Paper lanterns hung from tent ceilings. Since you are considering an outdoor wedding, timing is important. And the wedding is the best when the sun is less harsh. This, of course, will prevent discomfort for your guests. It won’t be fair for the guests to get burnt skin as souvenirs. Pests can’t be stopped from attending an outdoor wedding, but properties can’t be protected from them. Get covers for the foods and desserts stands, while the cake should have a wedding cake cover. The wedding venue should be fumigated or sprayed before the wedding, using pest controls and citronella candles. Lightning is an integral part of an outdooring plan, especially the reception. Thus, use ancient methods like torches and candles to light up the place. More modern methods are string bulbs and spotlights, these are equally divine. Ensure there are attachments for them. An outdoor wedding allows you to be creative with your menu, something which will not be allowed in a ballroom setting. The caterers can serve a BBQ or pig roast + lemonade or iced tea to match the humid weather. Materials to give your wedding that extra boost is necessary. This is because the tents are blank, they need to be beautified. Curtains, cushions, chandeliers etc. These are beautiful options. Inform them to wear appropriate shoes to suit the location. Provide sunscreen for the harsh sun. Prepare for the cold with blankets in hand. Wedding Planning involves paying attention to details and getting creative. Therefore, here are some tips to guard you against making wedding planning mistakes. 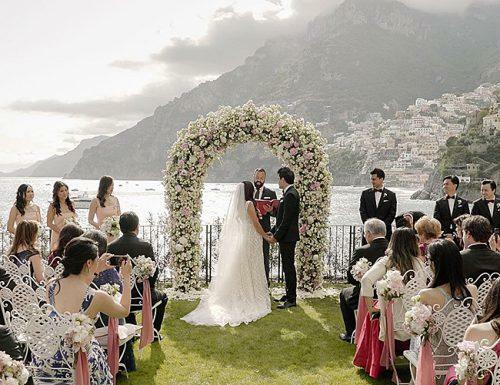 All in all, choosing an ideal venue for your outdoor wedding is a huge decision. Thinking of how to plan an outdoor wedding is another, but no worries. This article is a blue print to assist you with a unique outdooring plan that will leave you with cherished memories. For always!